It's what I call, "filling your cup"
We have had such gorgeous days mixed in with days of rainstorms. I won't complain because the garden is loving it! I hope all of you had a wonderful Mother's Day! We had a delicious dinner with all but one of our kids. I love being surrounded by my family! I've mentioned before that during the month of May the bees are buzzing in my garden. Well, not only are they buzzing outside, but inside as well. 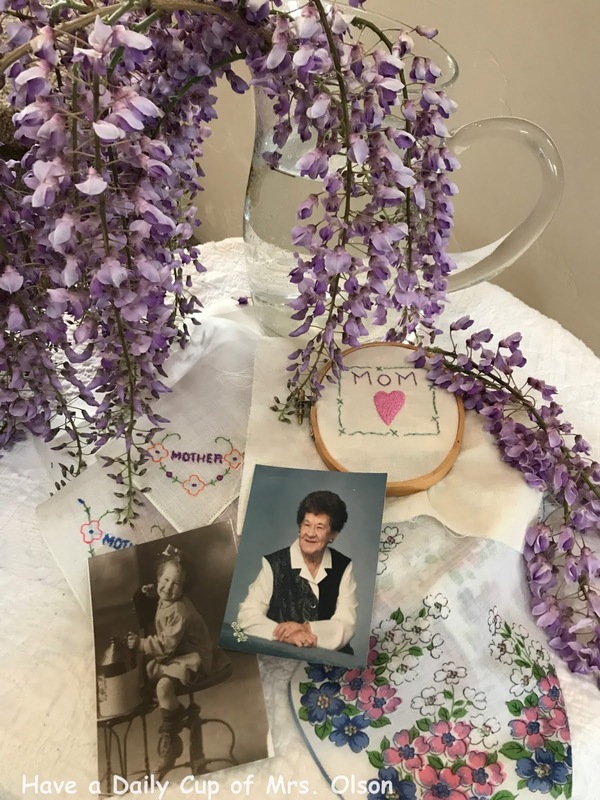 I also shared Wisteria. . .Mom's Favorite for Mother's Day. My son's Wisteria tree is breathtaking this year! Now, before I share this weeks features I want to mention a couple of upcoming link parties. 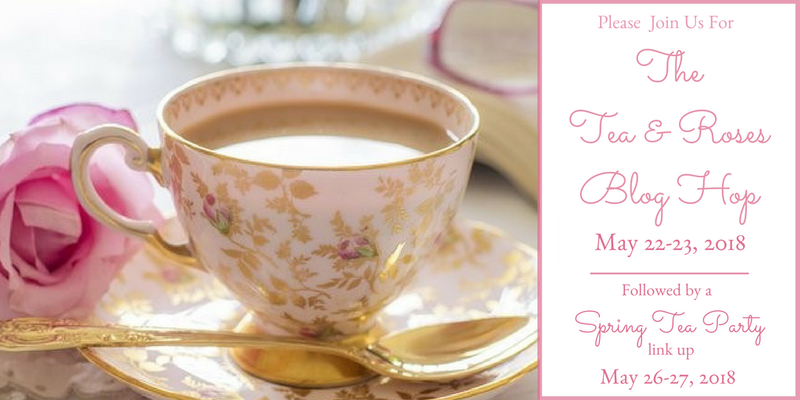 Next Tuesday and Wednesday the 22nd and 23rd I will be joining a sweet group of gals for a "Tea and Roses" blog hop. Then on Saturday and Sunday, the 26th and 27th we will host a link party to go along with it where you can share your Spring Tea. Also, on Friday the 25th our 2nd Garden Link Party will take place. May is a beautiful month in the garden! Can't wait to see what everyone has to share for both link parties. Ann Marie from Musings of a Vintage Junkie has been hitting the garage sales and finding some great treasures. I especially love these pennants! 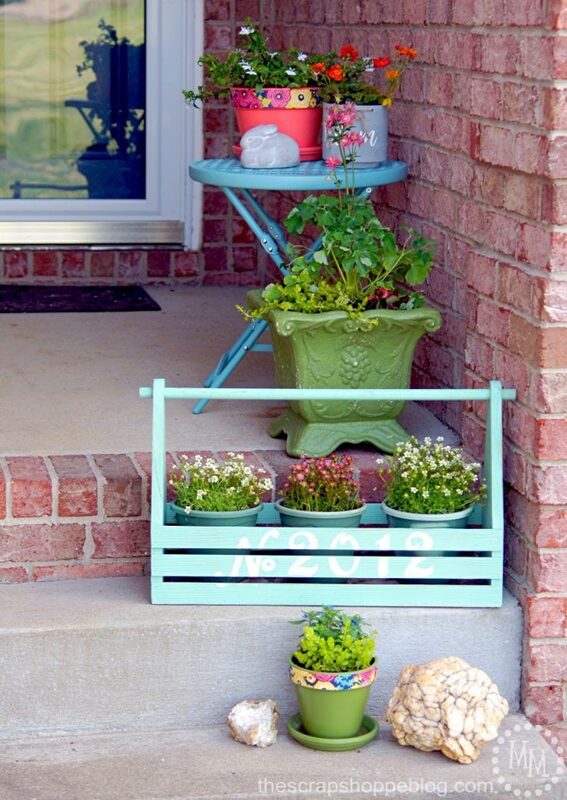 Michele from The Scrap Shoppe Blog has been sprucing up her front porch and making it so colorful and inviting! I don't know about you, but I would love a little peek into Kim from Sarah Lizzie's mind just to see how she comes up with the incredible things she creates! Just look at this amazing chair! Have you ever heard of Dandelion Jelly? Well, I hadn't, but Connie from Frugal Living on the Ranch shared her recipe. Doesn't it look pretty? 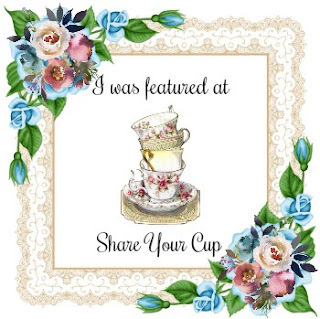 Thanks for sharing and please grab my button if you were featured. Hi Jann, thanks so much for hosting! Thank you, sweet Jann, for featuring my pennants. You made my day! thanks for hosting the fun and enjoy the weekend Jann. Oh, how lovely of you to feature my little chair, Jann. Thank you so much! Hi Jann! I'm lad that you had a wonderful Mother's Day. 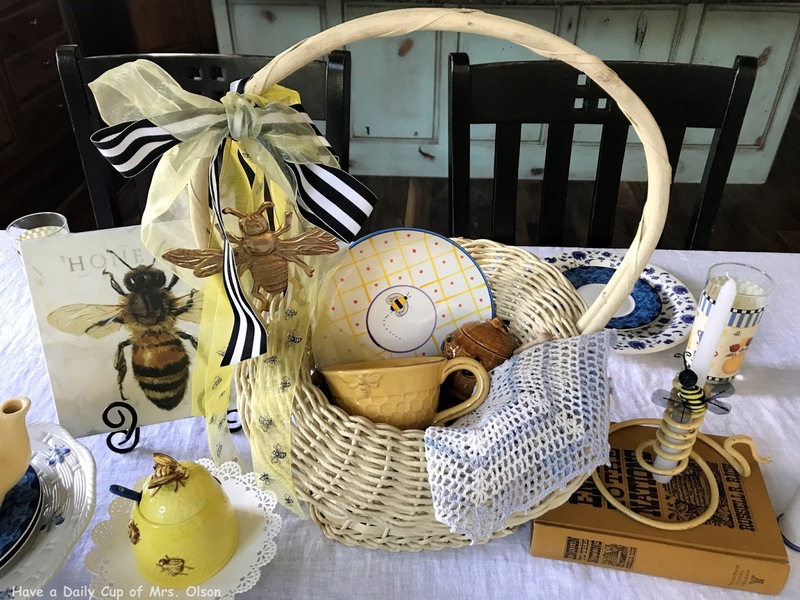 I loved seeing your bee tablescape and your Mom's favorite wisteria. I'd like to peek into Kim's creative mind, too. She sure creates magic, doesn't she? Thanks so much for hosting! Thanks so much for the party each week and thanks for visiting!! Thanks for hosting this lovely party. This is my first time participating. You have a really beautiful blog. Hi Jann! I'm Sharing my Cup today for your wonderful linky party! Thank you for hosting the party, Jann! Enjoy your day. Jann there are always so many beautiful features on your party. That rocking chair is so sweet. Thanks for hosting again this week and have a great day! 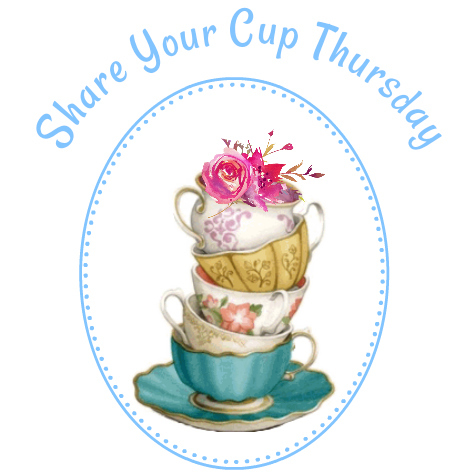 I am new to your blog- so enamored with the tea cups and love the calming theme! I am putting this on my link-list to share with you all- thanks for hosting! You are inspiring me to a cup of tea myself! Thanks so much for hosting, Jann. I hope that you have a wonderful week. Hello Jann, Just wanted to stop in for a bit of a party, I so need some inspiration lately! Have a wonderful day! Thanks for hosting Jann! Looking foward to next week! Jann, thank you for hosting. I think your mother was right - wisteria is pretty special! Thank you Jann for your 290th Share Your Cup. Always appreciated. Hugs. Thanks so much for hosting, Jann. Can't believe only 10 more to 300! As always, thank you for hosting. I hear a lot of work goes into these linky parties. Just know that you're appreciated! 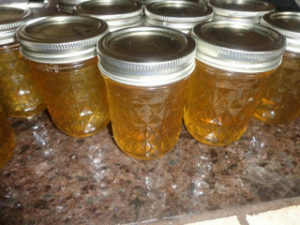 Jann, Thank you so much for featuring my dandelion jelly. And that you for hosting the party. Have a great day.